Is someone you know turning fifty? 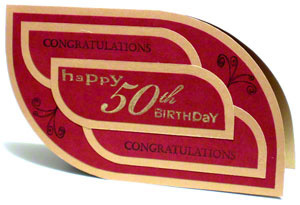 Then why not create this elegant 50th birthday greeting card for him or her. Fifty years is quite a big deal. And you can make a simple birthday card that shows this by using the gold color. Because this color is the symbol for this milestone. Cut the 4.5” x 5” maroon cardstock paper into three 1.5” x 5” strips. Use a 2” diameter circle to create curved corners at the top right and bottom left of the strips. Save time by taping the strips together and cutting all of them at once. Additionally, before cutting, mark the radius of the cut with a pencil in order to align it on the cutting mat. Remember to erase any pencil marks afterwards. Cut the 5.5” x 6” gold cardstock paper into three 2” x 5.5” strips. Use a 2.5” diameter circle to create curved corners at the top right and bottom left of these strips of cardstock. Glue each maroon strip to each gold strip with 0.25” margin all around. Score the 8.5” x 10 gold cardstock paper in the middle and fold it into a 5” x 8.5” card. Then use a 7.5” diameter circle to create curved corners at the top right and bottom left of the card. On the 4.5” x 8” maroon cardstock paper, use a 7” diameter circle to create curved corners at the top right and bottom left of the paper. Then glue this maroon cardstock on the folded 5” x 8.5” card with 0.25” margin all around. Arrange both black-stamped and glued strips on top of the card. The top-lettered-strip stays at the top left corner of the card and vice-versa. Glue the strips in place with 0.5” margins from their respective corner-edges of the folded gold card. Next, arrange the last gold-stamped strip right in the middle of the whole card. Hence, this creates a 1.5” margin from the straight edge of the strip to the respective straight edge of the folded card. Glue this last strip in place. To finish the 50th birthday greeting card, use black ink and rubber stamps to embellish the visible top right and bottom left backgrounds of the 4.5” x 8” maroon cardstock part. If you have a rubber stamp that reads “Happy Birthday” all together. Simply use your ink pad on only one word at a time. This way, you can add “50th” between those two words. In making the 50th birthday card, you can try out other black-stamped statements on the strips. For instance, if the card is for a loved one, you can acknowledge this by replacing the “Congratulation” statement with stamped heart shaped symbols.